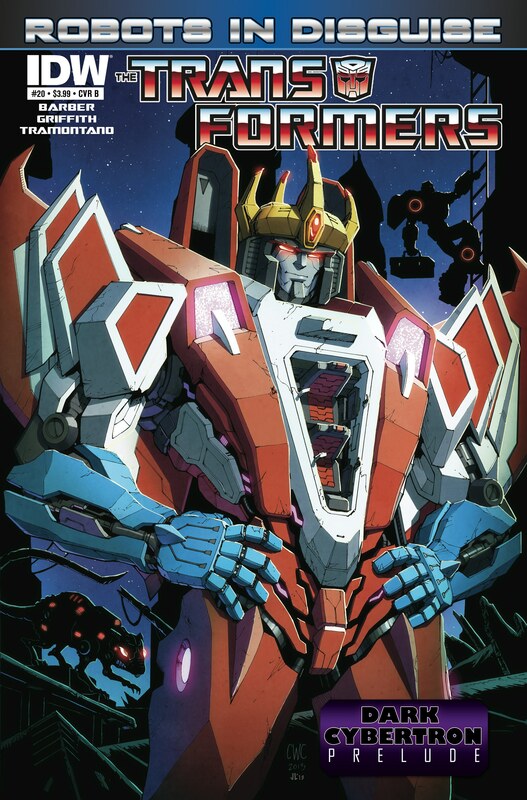 As with most of his Robots In Disguise stories, John Barber gets us right up close with one particular character over the course of “Three Monologues: Long Night, Young Evening, Early Dawn”. In this case it’s Starscream, and our loquacious ex-Decepticon here makes for a perfect speaker of the titular soliloquies. Barber’s stories often rely heavily on internal narration to get into the characters’ heads, but with Starscream everything is expressed externally – literally the only words in square narration-style bubbles are bits of dialogue carried over from off-panel. It fits the character to a T.
Another character best expressed by his fondness for his own voice makes his IDW debut here: Rattrap, who seems to aspire to be Starscream’s Starscream. Those hoping for a lovable jerk with a heart of gold may be in for a disappointment: Thus far this Rattrap seems more like a weaselly jerk with a heart of jerkiness. To be fair, though, most of what made him a likable character in Beast Wars came from many episodes of character development, and he hasn’t had any of that here. The other major player in this issue is Scoop, fresh from the news of a shiny new toy of him in our future. I can’t really say much about him without giving away plot points, so I’ll just say I like him. Andrew Griffith is back on art this issue, with Priscilla Tramontano on colors. Both keep the movement going and everything easily readable and flowing well. The art continues to be as high-quality as we’ve gotten throughout the series. Tramontano’s colors are bright and un-muddied, something exceptionally important with characters like these. I’m interested to see what Starscream’s “new body” is going to look like. I’m interested to see how the reveal at the end is going to play out. Also I am ready for more Aerialbots plzthnx. The tl;dr: Good issue, good execution, good characterization, though my verdict is still out on how much I’m liking this take on Rattrap.